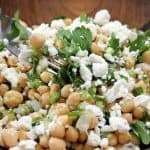 Delicious and super easy to make, this chickpea salad will wake up your taste buds, fill you up, and keep you on your healthy eating plan. In a large bowl, whisk together lemon juice, olive oil, minced garlic, salt, pepper, and cumin. Stir in chickpeas, spring onions, and parsley.